An academic health science centre (AHSC; also known as an academic health sciences centre, an academic health science(s) system, an academic health science(s) partnership or an academic medical centre) is defined by the Association of Academic Health Centers as: "an educational institution that includes a medical school and at least one allied health professional school and either owns or is affiliated with a teaching hospital or healthcare system". AHSCs are intended to ensure that medical research breakthroughs lead to direct clinical benefits for patients. The organisational structures that comprise an AHSC can take a variety of forms, ranging from simple partnerships to, less frequently, fully integrated organisations with a single management board. There are AHSCs operating in a number of countries including Australia, Canada, the Republic of Ireland, Japan, the Netherlands, Qatar, Singapore, Sweden, the United Kingdom and the United States. Health Sciences North (Sudbury, Ontario) Only trauma center in Northern Ontario and the neighbouring province of Manitoba. In 2007 a review of healthcare in London led by Professor Lord Darzi, A Framework for Action, recommended the creation of a number of AHSCs. 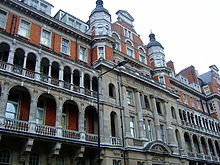 In October 2007 Imperial College Healthcare became the first AHSC to be established in the UK when the Imperial College London Faculty of Medicine merged with the Hammersmith Hospital and St Mary's NHS trusts. Four more AHSCs have subsequently been established in the UK and one is planned.Funding mainly comes from NHS and work was already "in hand to identify the funding" when expressions of interest were solicited. When contracts were signed with NHS in 2013, AHSCs shared among themselves around £60 million of funding. With a clear purpose, structure and approach of individual AHSCs is a matter for local decision especially with the contrasting approaches adopted as well as the differences in opinions voiced out by network founders. In recent years, broader academic health science networks have also been created, mostly attached to original health science centres, although cumulatively providing national coverage. ^ Wartman, Steven (2015). The Transformation of Academic Health Centers: Meeting the Challenges of Healthcare’s Changing Landscape. Elsevier. p. 290. ISBN 9780128007624. Retrieved 16 December 2018. ^ a b Dzau, Victor J; Ackerly, D Clay; Sutton-Wallace, Pamela; Merson, Michael H; Williams, R Sanders; Krishnan, K Ranga; Taber, Robert C; Califf, Robert M (March 2010). "The role of academic health science systems in the transformation of medicine". The Lancet. 375 (9718): 949–953. doi:10.1016/S0140-6736(09)61082-5. ^ a b "A Framework for Action". Healthcare for London. Archived from the original on 9 October 2010. Retrieved 5 November 2010. ^ "Brisbane Diamantina Health Partners > Home". Brisbanediamantina.com. Retrieved 2017-05-26. ^ a b c "University interventions aim to help heal a 'broken' NHS". Times Higher Education. 5 June 2008. Retrieved 5 November 2010. ^ Johnson, Sarah (26 April 2013). "Academic Health Science Networks: their role and development". London: The Guardian, 26 April 2013. Retrieved 22 July 2016. ^ "AHSN contact details". www.england.nhs.uk. NHS England. Retrieved 2019-04-12. ^ "Home". Cambridge University Health Partners. Retrieved 5 November 2010. ^ "Imperial College Health Partners". AHSC. Retrieved 2019-04-12. ^ "Home". King's Health Partners. Archived from the original on 30 October 2010. Retrieved 5 November 2010. ^ "Home". 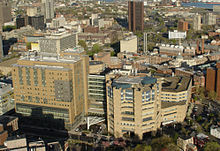 Manchester Academic Health Science Centre. Retrieved 5 November 2010. ^ "Health science centre brings University and NHS closer | University of Oxford". Ox.ac.uk. 2013-11-29. Retrieved 2017-05-26. ^ "Home". UCL Partners. Retrieved 5 November 2010. ^ "Academic health sciences collaboration". The Scottish Government. Retrieved 5 November 2010. ^ "Health Sciences Center Home - Health Sciences Center". University.ghs.org. Retrieved 2017-05-26. ^ "UCD School of Medicine & Medical Science : Dublin Academic Medical Centre". Ucd.ie. Retrieved 2017-05-26.